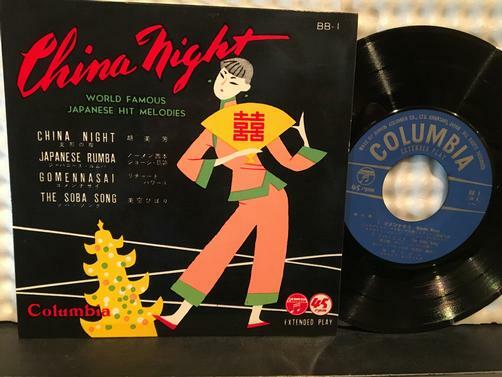 RARE ORIGINAL 1960s JAPANESE PICTURE SLEEVE: China Nights: World Famous Japanese Hit Melodies. Produced in Japan, this EP is unplayed. Vinyl is excellent. JM--5-3 and H-24 on side 1 and JM-6-4 and 3-H on side 2 in dead wax. Labels are excellent. Cover is excellent. 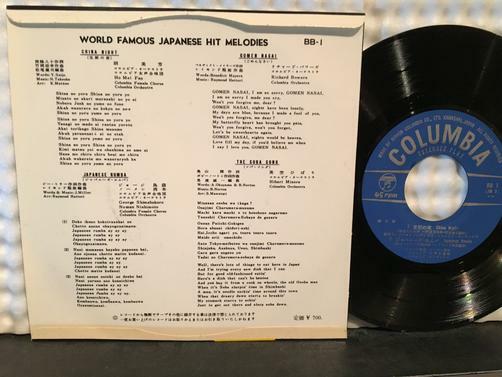 Has both English and Japanese lyrics on back cover; English and Japanese song titles on Label. Songs: China Night, Japanese Rumba, Gomennasai, The Soba Song.